MAN Diesel & Turbo has announced plans to carry out full-scale ME-GI testing at the company’s Copenhagen test centre. 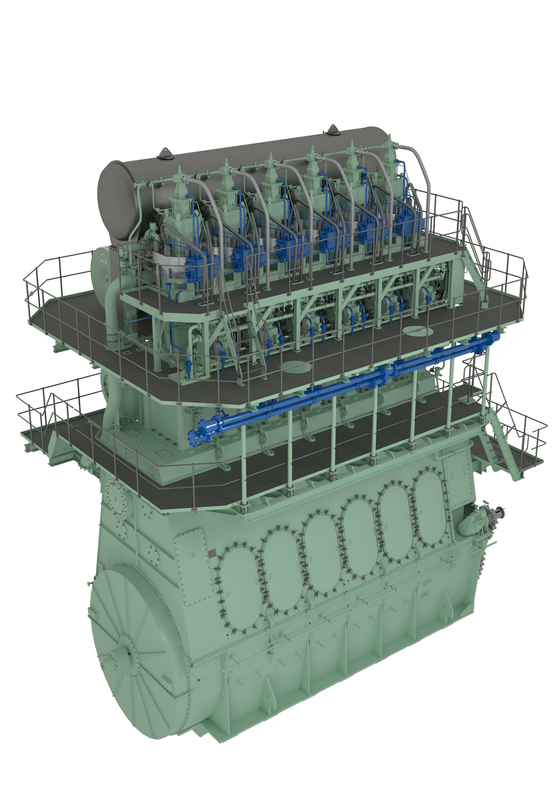 MAN Diesel & Turbo has decided to make a full-scale demonstration and performance verification test of the GI principle for all kinds of marine applications on its 4T50ME-X R&D research engine, which will be rebuilt as a 4T50ME-GI engine and ready to operate on natural gas around the turn of the year. The announcement comes as the company sees significant opportunities arising for gas-fuelled tonnage as fuel prices rise and modern exhaust-emission limits tighten. Indeed, previous research indicates that the ME-GI engine, when combined with exhaust gas recirculation (EGR) and waste-heat recovery (WHR) technologies, delivers significant reductions in CO2, NOx and SOx emissions fulfilling Tier II and Tier III regulations. The test plan continues the momentum built up at a ceremony in Copenhagen in February of this year where MAN Diesel & Turbo signed a development agreement with Korea’s Daewoo Shipbuilding & Marine Engineering Co., Ltd. (DSME) to jointly develop and exploit the adaptation of DSME’s high-pressure cryogenic gas-supply system for installation with the ME-GI engine. MAN Diesel & Turbo sees the potential market for its ME-GI engine extending from LNG carriers to LPG and other oceangoing vessel segments such as containerships as well as ships plying a fixed trade. As such, MAN Diesel & Turbo is ready with a highly efficient propulsion-plant solution. The ME-GI engine is a gas-injection, dual-fuel, low-speed diesel engine that, when acting as main propulsion in LNG carriers or any other type of merchant marine vessel, can burn gas or fuel oil port to port, depending on the energy source available on board and dictated by relative cost and owner preference. MAN B&W ME-GI (Gas Injection) two-stroke engines possess economical and operational benefits compared to other, low-speed engine plants, irrespective of ship size. Based on the successful, electronically controlled ME heavy-fuel-burning diesel engines, the ME-GI design accommodates natural gas and liquid fuels. Dual-fuel operation requires the injection of both pilot fuel-oil and gas fuel into the engine’s combustion chamber via different types of valves arranged in the cylinder head. The ME-GI engine head is fitted with two valves for gas injection and two for pilot fuel. The pilot-oil valve is a standard ME fuel-oil valve. MAN B&W ME-C and ME-GI engines are broadly similar and share the same efficiency, output and dimensions. In comparison, the ME-GI engine’s key components are its modified exhaust receiver, modified cylinder cover with gas-injection valves and gas-control block, an expanding top gallery platform, high-pressure fuel-supply pipes, and mounted gas-control units.